The successor to the current Wave 3 version of Windows Live Messenger has finally been unveiled. 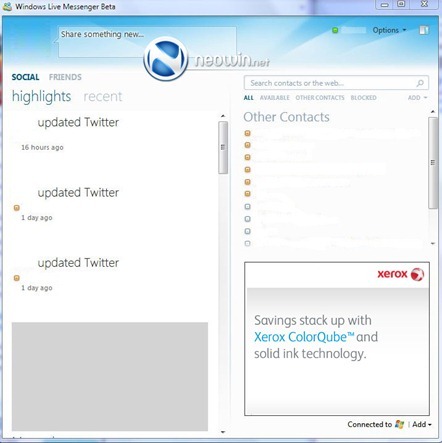 Neowin has got hold of exclusive screenshots which shows off the next version of Windows Live Messenger, that is going to be the part of Windows Live Wave 4 release. The most significant change in Windows Live Messenger 2010 is the added option for “social stream” updates, which is going to retrieve all your friends updates across various network activities like facebook, twitter and blog posts, that you have added in Windows Live. Another welcome change is the added support for tabbed conversations in chat window. This functionality was requested for years and it seems like Microsoft has finally listened to the feedback provided by users by building this into the client app. Most of the other features are still unknown and by the looks of the screenshots, UI still seems to be in the early stages of the development. This Messenger client along with other updates for the entire Windows Live Essentials suite is due for some time now. We can expect them to be out in the first half of 2010 as part of Wave 4 release of Windows Live at either Consumer Electronics Show in January, or at the MIX10 conference in March 2010. You can follow me on twitter or join our facebook fanpage to keep yourself updated on all the latest from Windows Live releases. What remains now is only just Facebook Chat, Google Talk, Yahoo and Gmail integration. Like Digsby maybe? And I'm SOLD! This looks really gross. I have been using Windows Live Messenger since the “MSN Messenger” days on Windows 98, and I loved how minimal the interface was. Back when it was still MSN, there was an update that added a ton of features, new graphics, the ability to shake the window, etc., and I remember being irritated back then. This is just too much. The window is huge. Chat programs should have a small contact list that can be easily minimized, and that should be the main interface. I don’t want something that runs in the background taking up my whole screen. It’s not Microsoft Outlook… it’s just a chat client. I hope Microsoft re-thinks this idea soon. Guys be in Patience… it is in Beta Phase and the release of this forum is a bit old… maybe they was showing the new features. The interface will be looking different, i hope it. Every version of MSN or Windows live messenger now show us every surprise about their version, right?